Plaza Beach Resort Bonaire - Caribbean & Co.
Plaza Beach Resort Bonaire is the island’s first and best all-inclusive resort. Located on one of Bonaire’s finest beaches, the resort is just a 15-minute walk from the colorful city of Bonaire, Kralendijk. 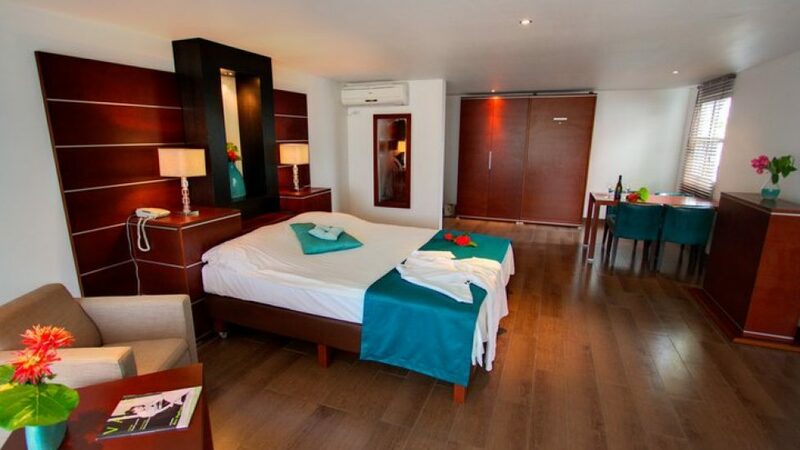 The Plaza Beach Resort Bonaire offers 126 rooms, 60 Grand Suites & 66 Standard Junior Suites with either ocean or Laguna view. All rooms are air-conditioned, with balcony or patio and equipped with satellite and national television, telephone, coffee maker, mini refrigerators, hair dryer (junior suites), private bath and shower and a safety deposit box. With many facilities like a private sandy beach, a marina, boat rentals, activity center, swimming pool, childcare, restaurant, free wifi and motivated team of staff members, Plaza Beach Resort Bonaire offers you a carefree holiday to enjoy to the fullest!